In a recent trip to England, I visited Durham Cathedral in hopes of viewing several of the Anglo-Saxon manuscripts found in the Cathedral Library. As the Managing Editor of the Dictionary of Old English, I was looking forward to seeing the actual manuscripts rather than the poor copies which we consult regularly during the process of writing entries for the Dictionary of Old English (DOE). I was particularly interested in the Durham Ritual (Durham Cathedral MS A.IV.19) and a small Latin – Old English glossary of herb names found in Durham Cathedral MS Hunter 100. Each of these two manuscripts provide particular points of interest when it comes to dealing with their content. The Durham ritual is a tenth-century Latin manuscript which (like the Lindisfarne Gospels) has had a running gloss of Old English added in tiny script above each Latin word. What is unusual about this particular manuscript is that the Old English is highly abbreviated with many atypical spellings. When we write a dictionary entry for any Old English word, we try to include all the known spellings and the Durham Ritual provides many that do not occur anywhere else in the extant Old English corpus. Durham Cathedral MS Hunter 100 is a manuscript written at Durham shortly after 1100 and it piqued our interest because it contains, in its glossary of herb names, the earliest instance we can find of the word lavender (predating that noted in the Oxford English Dictionary). As it happened, I was unable to see either manuscript since the Durham Ritual is presently a part of the British Library exhibit, “Anglo-Saxon Kingdoms: Art, Word, War” and Hunter 100 is too fragile for display. Most fortunately, both manuscripts are now available as part of the “Durham Priory Library Recreated” project, and can therefore be viewed online. When several members of our project visited the digital site, we were very impressed with the high quality of the manuscript images. They are a huge improvement over what was previously available to us and as such, a great boon to Anglo-Saxon scholars. The Dictionary of Old English (DOE) defines the vocabulary of the first six centuries (C.E. 600-1150) of the English language, using twenty-first century technology. The DOE complements the Middle English Dictionary (which covers the period C.E. 1100-1500) and the Oxford English Dictionary, the three together providing a full description of the vocabulary of English. The Dictionary of Old English (DOE) is a research project based at the Centre for Medieval Studies at the University of Toronto, Canada. Begun in the 1970s as a ground-breaking foray into the digital humanities, the DOE has two distinct areas of focus. First, it has assembled and digitized the entire extant literature written in Old English between CE 600 and 1150. 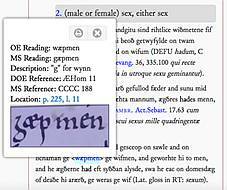 Every written word, including poetry, charms, inscriptions on jewelry and on stone, historical and legal documents, botanical and medical texts, has been input to build an electronic corpus of Old English. Second, the DOE treats this digital corpus as the master source for the dictionary. Before defining any word, the editors of the DOE survey each and every example of it occurring in this corpus, reviewing, analyzing and organizing the evidence to produce an entry that documents every nuance of the word. 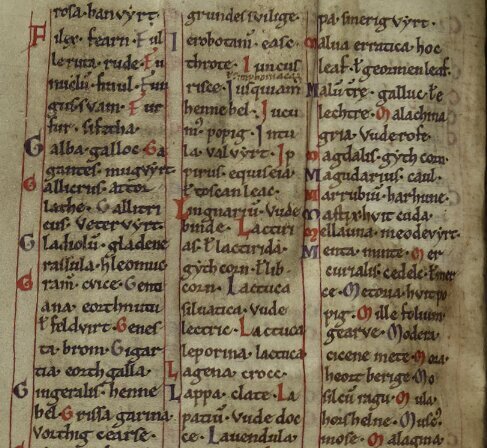 The Dictionary of Old English has published online eleven fascicles to date, which cover the first ten letters – A to I – of the 22-letter Old English alphabet. We are presently working on drafting entries beginning with the letter L.
A notable feature of the online DOE: A to I is the incorporation of manuscript images. These images, which allow readers to see contested passages, enable DOE users to examine manuscript evidence for themselves. As more manuscripts become available online, we hope to expand the number of these links to problematic passages.